Unbelievable cheesery (is that a word?). Love everything about this place, great lunch. Looks like there's limited seating so expect to take-out. The mac and cheese has a lot of flavor and none of that fake easymac ish. I would get the small and get a salad to balance the heaviness. Or just eat the large like I did because what's health? 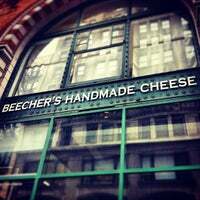 Some of the best handmade small batch cheese in NYC. The Flagship 15 mo. aged cheese is creamy and delicious, but the four year aged Flagship is truly outstanding! The best Mac and cheese I ever had. You can sit down and see they making your cheese while you eat it! The mac and cheese IS great but it's too mushy to be the "world's best." Plus, it comes from a big soup pot so there's no crustyness. Este lugar es increíble! 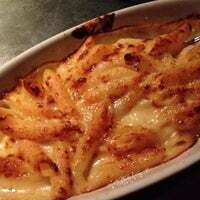 !, el Mac & Cheese realmente es el mejor de el mundo, todo el lugar huele a queso recién hecho. Hagan reservación antes de ir y pidan la Main Root Mexican Cola, esta deliciosa. 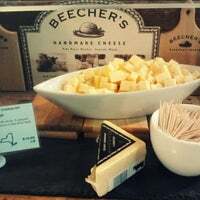 Village Voice is proud to welcome Beecher's to the 2014 Choice Eats food fest! http://bit.ly/1cRzdNV. 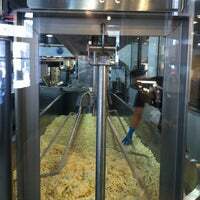 Dine on tasty food upstairs or perhaps wander down to the cellar--or "The Cheese Cave"
Mac and cheese is made with penny. They don't try and do anything fancy with it except use tasty cheese which is a nice change of pace from all the variations out there. New York location of the great Seattle-based cheese shop. 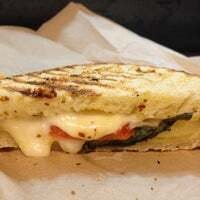 The grilled cheese sandwiches are some of our favorites. Kale & Mama's Li'l Peppers mac & cheese is legitimately spicy, but super delicious. Go for it. Did you know they have happy hour until 7pm? $7 glass of wine and $8 (small) cheese plate. Good way to kill 2 hours with a friend. Although the cheese cream is good, the mac in the mac and cheese is way too soft. (Try Murray's!) The fig and cheese sandwich is good! Cheese is on point! The mac & cheese was some of the best I've ever had. The giant cheese melting pots they have are pretty mesmerizing, too. 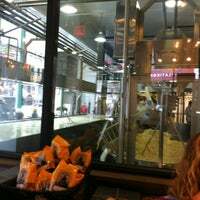 Grab a drink downstairs (they make a mean old fashioned) and then take it upstairs to the sitting area above the cheese making. 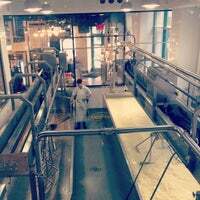 Watch them make the cheese while you munch on a grilled cheese sandwich. 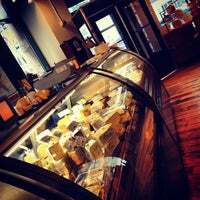 It also has a great selection of quality American-made artisan cheese. You already know about the cheese I presume, but try the wine bar downstairs and drink every time you can feel the subway go under your feet. Mac & Cheese is the da bomb! You must try it and try grilled cheese as well! They made their own cheese in-house. Try the house brand 'signature' cheese. It's good! 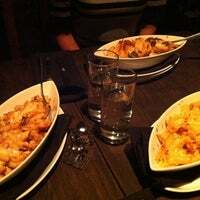 Best macaroni and cheese I've ever eaten at a restaurant. It tastes EXACTLY like my grandmother's...and that's high praise since she's from the South. 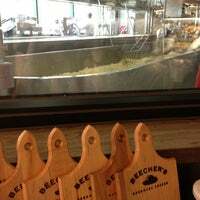 Lots of love for the Mac & Cheese, the real standout is their house-made cheese curds. self-anointed WORLDS BEST mac n cheese, but try the grilled sandwiches too. head down to the cellar if you want some booze with yo cheese. 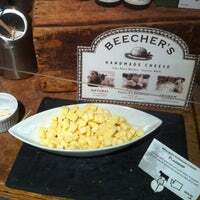 Filled with Beecher's Flagship cheese, a super-rich variety similar to Vermont cheddar, which is made in house. The nice thing about this sandwich is that it's not exceptionally greasy. 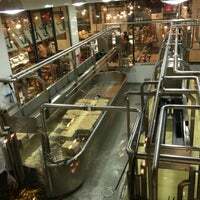 Amazing experience, trying all of the cheeses while watching cheese being made! So much fun! Happy Hour - get the Mac and Cheese. House wines are excellent and well worth the $6. Catch the city's best mac and cheese and treat yourself to a some wine too during the amazing half-price happy hour specials. Mac & Cheese!!! Crab M&C is excellent as are the meatballs. Insider tip: add the sauce from your meatballs to the crab mac & cheese. It's all about the happy hour. A buck off all coffee drinks, 2:30-3:30. Oh, and free samples of cheese. Mac & cheese, grilled cheese sandwich, tomato soup. Everybody mentions them because they are EXCELLENT! Highly recommend their flagship cheeses. 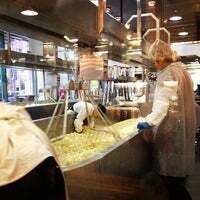 Their curds or "squeaky cheese" is also a favorite. Cheese made in manhattan! The equipment takes a lot of space. House cheese plate with extra Thai chili spread. Top it off with a Cherry Whack. Ask for a Grilled Cheese Martini downstairs... It's not on the menu and one of the more, um, 'interesting' drinks in the city. Do you want fantastic domestic cheeses while being tended to by a well informed staff? Look no further. Check out the bar downstairs and try the balsamic mushroom fennel mac and cheese. 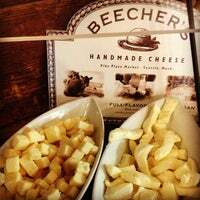 Grab a sandwich in our cafe, watch the cheesemakers at work, or wander downstairs to The Cellar to enjoy a glass of wine next to row upon row of cheese. "Cute little wine bar in a cellar. Great ambiance." 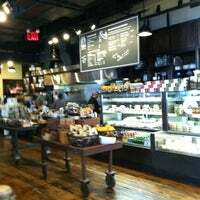 "Cheese monger was incredibly helpful, let us taste about 15 cheeses! Very nice and fun and will be going back." "This is my heaven. All of the cheese your heart could possibly desire. Super friendly and helpful staff! Take their suggestions because they know what they're doing!!" "Love love love it if your a big fan of cheese and also they have a good menu of Wine so I ll go again"
"The pistachio gelato is amazing! So was the cacio e pepe at La Pasta... Smallish portions for the price, but the food is great." "Love love love this theater. It's small and never crowded. Clean restrooms!" "Lots of interesting gift here! 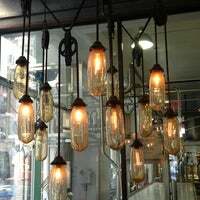 Definitely must visit this store!"